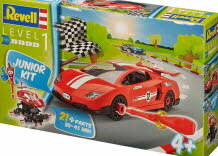 the red Sports car Junior Kit has 21 parts and is 24 Cm long. Designed for Children of 4 years and over and comes with plastic tools to build it with. Once built it is a great toy to play with see the rest in the range. the Police Car Junior Kit has 26 parts and is 23.5 Cm long It also has 2 versions of the stickers European Spelling and British Spelling. 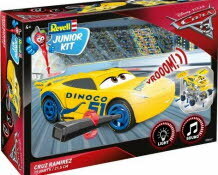 the Off road car Junior Kit has 23 parts and is 21.5 Cm long. the Emergency Ambulance Junior Kit has 39 parts and is 26 Cm long. The rubbish collection is coming! Quickly assemble your garbage truck and off you go. Roll the garbage can to the vehicle and connect it up. Operate the emptying lever and tilt the entire contents with one movement into the collection container. Once you arrive at the yard you will be able to empty your load of garbage by tilting the container. 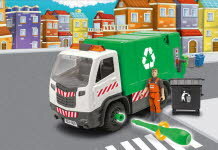 You can get help from the fully adjustable and positionable refuse collector figure who is able to do his job outside of the refuse truck behind the wheel but can of course also take the seat behind steering wheel. Small garbage collectors of 4 years and older can easily assemble the model with the screwdriver included. Its child friendly and requires little effort. The coloured, easy-to-understand assembly guide leads them step by step to the finished model. A surveillance mission for the police! Build your surveillance van and catch the criminals in the act with it. You will not miss any of their evil deeds with the mobile surveillance camera mounted on the roof of the vehicle. A fully adjustable and positionable policeman figure is standing by your side. He can do his duty in the drivers seat or outside the vehicle. Small law keepers from 4 years of age can easily build the model without any effort using the enclosed screwdriver. The coloured, easy-to-understand assembly guide leads them step by step to the finished model. 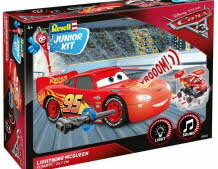 Lightning MCqueen Junior Kit has 19 parts and is 20Cm long. Designed for Children of 4 years and over comes with a light and sound module for realistic effects and plastic tools to build it with. Once built it is a great toy to play with see the rest in the range. 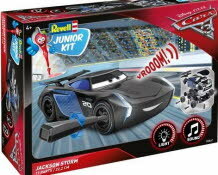 Jackson Storm Junior Kit has 19 parts and is 22Cm long. Cruz Ramirez Junior Kit has 19 parts and is 21.5 Cm long. 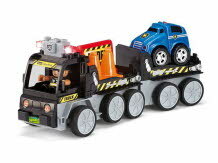 Children aged three and above can play breakdown rescue with this new tow truck.The additional mini car and flashing LED lights guarantee lots of playtime fun. Thanks to the 2CH MHz remote control adapted for small children's hands, the vehicle is easy to drive forward/back and steer to the side.